Check out - NEW OPERAMINI FOR ANDROID RELEASED; DOWNLOAD NOW!!! The new Opera Mini runs on Android versions 2.3 and higher. 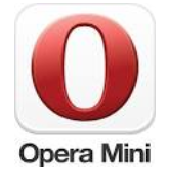 If you have an older Android version, don’t fidget; Download classic Opera Mini for Android. Opera Mini is one of the fastest browsers so far. Opera Mini’s compression technology loads pages faster to deliver the heaviest of content to you, even on the slowest of internet connections. This makes surfing a tweak. Opera Mini browser for Android gives you a fast, full web experience. Save data while surfing and downloading content from web. Opera Mini’s high data-saving technology ensures powerful compromised web experience. With your opera browser, you view sites how they were intended, with beautiful images, layouts and text, while getting the most out of your data plan. The new Opera browser for Android offers a useful video compression tool to shrink the size of online videos, along with a new option for installable web apps. The video compression feature of Opera browser for Android saves data by reducing the size of online videos. This way, the videos will consume less data and work better even on poorer internet connections. • More advanced settings which gives users greater control over their browser experience. • Opera users on Android can also add websites to their home screen as speed-dial treating them as installable apps for easy access. • There is also substantial data savings and a new way of tracking how much data you’ve saved which will help you extend your data plan. And, for those looking for even more data savings, Opera Mini also provides an extreme savings mode. • Facebook notifications with profile pictures keep you updated at a glance. • Get the latest news: Enjoy one-click access to the top stories and freshest content from across the internet. • Night mode: Dim the screen to reduce eye strain. • Customize your browser: Tailor Opera Mini with different looks to suit your style. • Switch up your search: Choose between different search engines to suit your needs. • Opera Mini will notify you when your files complete downloading. Simply click on the notification and start viewing your downloads. Download Opera Mini for Android Now!!!…………. and enjoy one of the fastest browsers for Android. You can try the quicker way to browse the internet on your mobile device.